Four star, five star, how about a three star? Yes, the stars are aligning in 2019 for Eventing calendars around the world as the new Fédération Equestre Interationale (FEI) classification system gets going this year. While it may seem an easy change to the same old way things have been done, the new star system will take some getting used to. In general, events that were previously set at each star level have been granted an additional star for 2019. For example, the LandRover Kentucky Three-Day Event, currently the only CCI4* in the U.S., has been granted CCI5* status for 2019. In fact, all six CCI4* events around the world are now classified as CCI5* events. Current Concours International Combine (CIC) events are now classified as CCI – S (short) where as Concours Complet International (CCI) events are CCI- L (long). Traditionally, when the sport of Eventing held full three-day events that with an “endurance” day consisting of roads and tracks, steeplechase and cross-country phases, a CCI event was a long format event while a CIC event was short, holding only the cross-country phase of endurance day. In more recent years with the dropping of the long format, a CCI event had a longer cross-country course with more jumping efforts. Thus CCIs are now being called CCI – Long and CICs with shorter cross-country courses are now called CCI – Short. The Olympic Games have been given their own special category that is in essence a combination of what was the CCI3* and CCI4* levels. The level of competition at the next Olympic Games, held in Tokyo in 2020, will be a four-star dressage and show jumping test with a three-star cross-country course. The idea is to allow for more countries to qualify teams. Other FEI changes to the Olympic Games will limit teams to three riders with no drop score. “Here in the U.S., we were against the Olympic change but I understand how it will help more countries qualify and compete at the Olympics,” Burk added. In previous years, the highest level of international Eventing competition was the CCI4*. Now the CCI5* has taken that coveted top spot. The CCI5* will be an international level three-day event that will offer a 5* dressage test and show jump course along with a 5* cross-country course consisting of 40-45 efforts in 11-12 minutes. There are other requirements as well for this new top level that five-star venues will have the next two years to fulfill. The new requirements include a mandatory minimum level of prize money of 150,000 Euro, mandatory closed-circuit televisions for the public, athletes, owners and ground jury, and a minimum number of 30 starters with a maximum number of 75. The cross-country course will need to be changed from 6,270 to 6,840 meters with 40-45 efforts in 11-12 minutes. Starting in 2020, those venues wishing to maintain a five-star status will need to undergo yearly reviews. Here in Maryland, there are two venues that offer three day events for the 2019 calendar: Fair Hill International and the Maryland Horse Trials at Loch Moy Farm. FHI will be offering CCI-S divisions at the new two-, three- and four-star levels on April 19-21. Their big October international has been upgraded to a CCI-L for the three- and four-star levels and is set for October 16-20. MDHT has moved its annual CIC one- and two-star to its first weekend of summer competition this year. It will hold CCI-S divisions at the new one-, two- and three-star levels July 4-7. MDHT is one of only two venues in the U.S. so far to have added the new CCI1* level of competition. Organizer and Loch Moy Farm owner Carolyn Mackintosh said, “Now that Great Meadows has moved to August, we can move our three day back to the first weekend when the ground is better.” Mackintosh went on to explain that the fields at Loch Moy are aerated and rested for much of June and July in preparation for its two weekends of USEA competition. 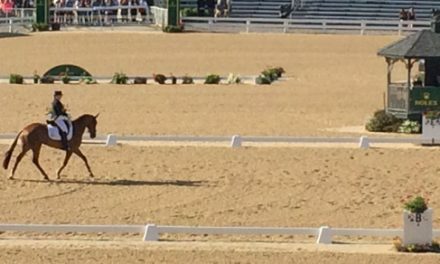 When the USEA first issued a proposal back in 2017 to add a new international level competition to its calendar, the bid was for a CCI4* to be held in the fall. Fair Hill International was voted as the proposed location of this new four-star and was granted its bid request by the FEI in 2018. At first, the goal was to hold the four-star in the fall of 2019 but once the FEI started to play with the star classification system, the crew at FHI put things on hold awaiting the FEI’s star decisions. Now that the stars are in place, FHI co-president Trish Gilbert reports that plans are underway to host a CCI5* in the fall of 2020. “It’s a work in progress, but that is the current plan,” Gilbert stated. The King is in The Hall!